I am trying to get into the holiday spirit over here. After Thanksgiving going so well, I hoped for an easy Christmas season. But, I’m struggling. I just have no Christmas cheer. I’m trying to ‘fake it till I make it’ for the kids. On top of that Jonathan got sick last week, and we’ve not had a decent nights sleep since. One thing I’ve learned; lack of sleep makes dealing with emotions harder. Hopefully, the cloud of sickness is on its way out and some rest will help me get back on track. Anyway, I’m trying to find the balance here. I’m not sure that Christmas cheer is all that necessary, really, to appreciate the true meaning of Christmas. Unfortunately it is necessary for the emotional well-being of my children, so I gotta find more of it… and soon. Listening to Christmas music, reading Christmas stories, hearing about the awesomeness of spending time with family, and how family matters most during this time of the year, etc– not so easy. Crafting and cooking with my kids– easy! For now, that’s my Christmas celebration. Festive crafts and yummy food. Those two I can handle. 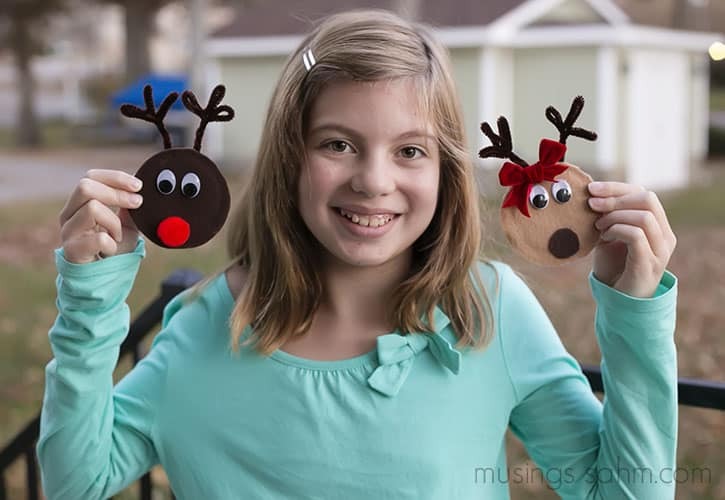 Speaking of festive crafts, check out these adorable Rudolph and Clarice magnets we made for a guest post over at Musings From a SAHM. We think they are pretty adorable. I love how easy they were for the smaller half of my crew.